Stupid, offensive and as substantial as a text message, this toxic piece of kiddie trash isn't worth the pixels. Disregard that PG rating and keep your children far away from director Tony Leondis’ vile animated faux-comedy. Beneath its trippy surface lurks an insidious philosophy hazardous to impressionable minds. 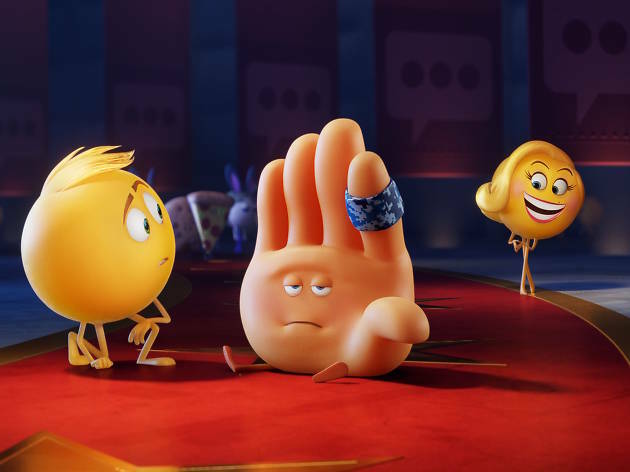 The Emoji Movie openly rolls its eyes at full-fledged thought, legitimizing poor communication skills by cheering on the decay of attention spans. Early on, a character gleefully declares, “Words aren’t cool!” Is that the ideology the screenwriters embraced? It’s a fair question. The lamely sarcastic plot is set in Textopolis, a soul-numbing world that exists within a smartphone’s messaging app. It looks like an ugly knock-off of the elegant human brain design in Inside Out, with apps substituting for various neighborhoods and emojis filling in for emotions. The owner of the phone is young Alex, a nice kid we don’t really get to know, because who has time for human nonsense? We instead follow the blah-faced “meh” emoji, Gene (voiced by Silicon Valley’s T.J. Miller), whose unlikely capacity for expression threatens the existence of his shrug-centric universe. In order to become a normal, functioning meh before Alex erases his phone, Gene joins forces with the avatar of a rogue hacker, Jailbreak (Anna Faris), as well as the upbeat emoji Hi-5 (James Corden), on a dangerous journey to the Cloud. A game of Candy Crush, a cruise down Spotify and a session of Just Dance are among the trio’s excruciatingly simplistic adventures that leave you alarmed about the filmmakers’ perception of human intelligence. Throwing in a Casablanca reference and some lip service to feminism (“Did you know female emojis could only be brides and princesses once upon a time?” Jailbreak says) doesn’t really help in a movie that only wants to dumb us down. If you have to sit through it, remember to not take your anger out on your phone. This piece of 💩 isn’t worth it. I don't often seek reviews and i thought on searching on this movie. I was suprised by the thoughtfulness that was into doing this review. I really liked it and want to congratulate you for writing such a wonderful one. To the point imo.